Whitney Vickers and Dave Deskins, the superintendent of the Greene County Career Center (left), were the finalists in the second flight of celebrity competitors during the Celebrity Swine Showmanship event, Aug. 1 at the Greene County Fair. In the opening competition, WHIO TV’s Gabrielle Enright won, with WRGT TV’s Megan O’Rourke finishing second. John Bombatch | Greene County News Whitney Vickers proudly holds her first-place trophy after winning the second group of the Celebrity Swine Showmanship contest Aug. 1 at the Greene County Fair. Whitney Vickers answers a question from judge Dr. Kevin Sharrett, during the second Celebrity Swine Showmanship event held Aug. 1 at the Greene County Fair. XENIA — Things weren’t looking too good for Fairborn Daily Herald writer Whitney Vickers and her new teammate, Darla, moments before the annual Celebrity Swine Showmanship competition Aug. 1 at the Greene County Fair. Darla, a 6-month-old cross-bred Gilt (for us rookies, that means Darla hasn’t had a litter of piglets yet) weighing in at over 200 pounds, developed quite an attitude prior to Wednesday’s second celebrity event. While Vickers was familiarizing herself with her pig, busy roaming the back pen areas and practicing her steering techniques, Darla simply decided she was done walking. It took two expert handlers and persistent coaxing from Vickers to finally get Darla to decide to move from the center of Swine building walkway and eventually into her holding pen, which led to the center ring. Turns out, Darla just needed the attention of about 300 or so fair-goers upon her — and the expert handling of Vickers, of course! — to get moving. 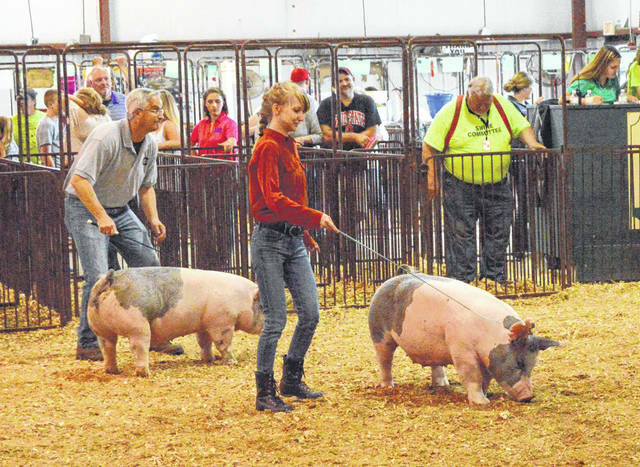 Vickers heeded the expert advice of 4-H veteran coach Nancy LeBeau, and kept Darla moving throughout the ring, and was persistent in steering the pig across the view of celebrity swine showmanship judge Dr. Kevin Sharrett. For a rookie pig handler, Vickers remained calm and collected, kept her eyes on the judge as often as she could, without having Darla wander off to visit with her sister who was also in the contest, and always wore a confident smile. Vickers edged Greene County Career Center Superintendent Dave Deskins for the Group 2 Celebrity Swine Showmanship title, making it the second year in a row that a celebrity handler from the local Aim Media Midwest newspapers had won the event. A year ago, Xenia Gazette writer Scott Halasz pulled off the win, also under LeBeau’s tutelage. Horney is a 4-H Club member from the Cedarville area who kindly loaned Darla to Vickers for the competition. According to LeBeau, a single Darla could find themselves entering the contest ring 2-3 times in a single day. The Pee Wee competition (not little pigs, little handlers) was also held on Wednesday, so Darla may have been part of that competition as well. It’s not uncommon for a judge to call out the pigs for review several times during a single contest. So by the time the late afternoon Celebrity competition rolled around, Darla was just plain tuckered. Vickers said she stayed focused, and Darla stayed lively. Sharrett was impressed with Vickers’ poise, despite having Darla scamper off from her right as she entered the ring to shake his hand. Asked how she intended to celebrate her Celebrity win, Vickers had a quick reply. “I’m going to go home and take a shower,” she laughed. https://www.fairborndailyherald.com/wp-content/uploads/sites/50/2018/08/web1_celeb01-1.jpgWhitney Vickers and Dave Deskins, the superintendent of the Greene County Career Center (left), were the finalists in the second flight of celebrity competitors during the Celebrity Swine Showmanship event, Aug. 1 at the Greene County Fair. In the opening competition, WHIO TV’s Gabrielle Enright won, with WRGT TV’s Megan O’Rourke finishing second. 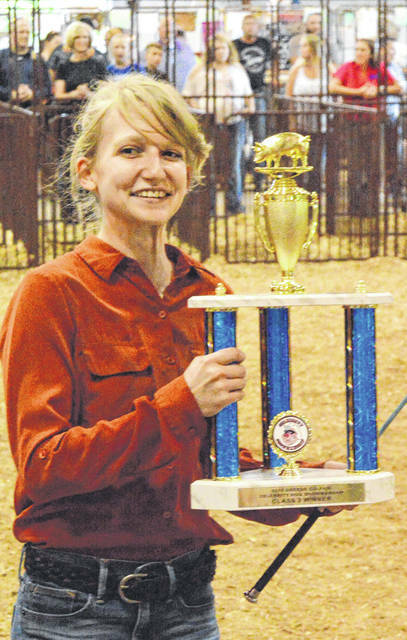 https://www.fairborndailyherald.com/wp-content/uploads/sites/50/2018/08/web1_celeb02-1.jpgJohn Bombatch | Greene County News Whitney Vickers proudly holds her first-place trophy after winning the second group of the Celebrity Swine Showmanship contest Aug. 1 at the Greene County Fair. 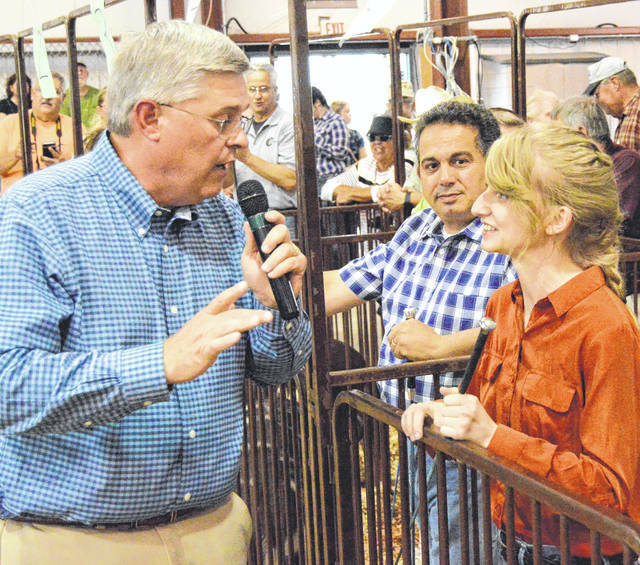 https://www.fairborndailyherald.com/wp-content/uploads/sites/50/2018/08/web1_celeb03-1.jpgWhitney Vickers answers a question from judge Dr. Kevin Sharrett, during the second Celebrity Swine Showmanship event held Aug. 1 at the Greene County Fair.